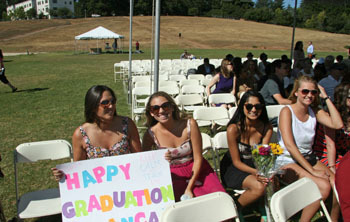 Friends and family cheered on graduates with signs, cheers, chants and songs. Graduate students preparing to receive their degrees. 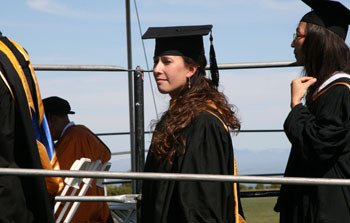 A soon-to-be graduate enjoys a reflective moment at East Field. 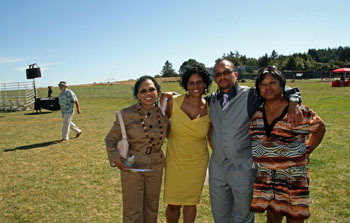 Family members showed their love and support for the graduates. Posing for photographs during Friday afternoon's commencement activities. 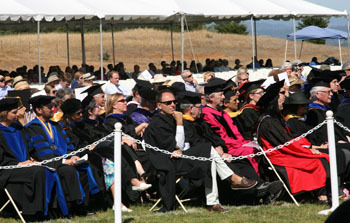 The weather was warm and breezy and the speakers were inspiring at UC Santa Cruz’s 2013 commencement celebrations, which attracted throngs of well-wishers and myriad speakers. More than 4,600 students received degrees across the weekend. 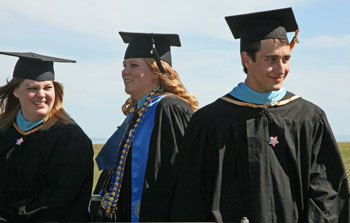 The sun was out, and celebrants – and even some of the graduating students – wore fresh-flower leis. Audience members waved hand-made signs and displayed messages printed on oversized helium baloons. On Friday afternoon, during the commencement celebration for graduate students, one young woman, carrying her infant son, cheered so loudly for her graduating sister that the baby woke up and started crying. Commencement ceremonies honored 4,195 candidates for bachelor degrees for work completed in the arts, engineering, humanities, physical and biological sciences, and social sciences. 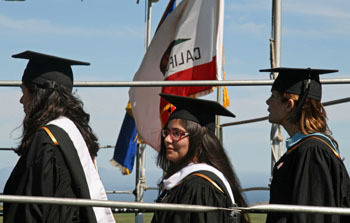 Spring candidates for bachelor degrees total 2,579, according to the UC Santa Cruz registrar's office. Another 1,616 completed coursework in the summer, fall, or winter quarters. There were many inspirational moments across the weekend. Among them: watching high-performing astronomy graduate students getting “hooded” by the likes of University Professor of Astronomy and Astrophysics Sandra Faber, listening to the inspirational remarks of U.S. Rep. Donna Edwards at the College Eight commencement, and watching a new generation of Slug alumni throw their caps high in the air. During her keynote address at Oakes College on Saturday, Audries Blake, daughter of founding Oakes College provost Herman Blake, told graduates to dream big and never give up. As one of her illustrations, she talked about “short” basketball players who had to work extra hard to win the confidence of their “height-dominant” teammates. Kresge College graduates gave a standing ovation to commencement speaker Megan Kostecka, a graduating Kresge senior who found a compassionate, healing community at UCSC after a horrific experience on the East Coast. After being beaten viciously by a mugger while enrolled in Boston University, she returned to her home in California. Kostecka decided to go back to college "and learn how to be a functioning 18-year-old again." She applied to all nine UC campuses for admission. UC Santa Cruz not only told her 'yes.' She even received a personal voice mail from the university: "we are rooting for you." "You may not have known it," Kostecka told the crowd, "but your compassion and kindness brought me back to life. Looking into the crowd I see a multiplicity of races, genders, personalities, and majors, yet I know we share one common virtue: compassion ... I do not know the causal relationship between compassion and UCSC. I don’t know if simply belonging to this community makes you a more caring individual or if we recruit students who excel in active empathy. Whatever the origin, I am certain that it is this capacity to identify with and value other human beings that truly makes us one of kind."